Abundantia Entertainment, T-Series Super Cassettes Industries Ltd.
A young and free-spirited journalist's life takes a 360 turn when she gets into a dangerous investigation for a story. One line Review: A balanced and sensible reporting to nurture the true spirit of the journalism is the key message delivered. Positive Points: The movie brings the issue of sensible journalism where desperate race of gaining TRPs and covering sensational stories drive the world of journalism. 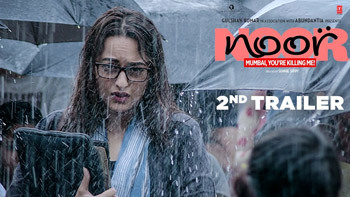 Sonakshi Sinha as Noor does justice to the character while Purab Kohli as Ayan Banarjee and Kanan Gill as Saad Sehgal seem to complement Sonakshi’s onscreen presence. Here is the new TITLE for Sonakshi Sinha, Diljit Dosanjh, and Karan Johar's film! Why the success of ‘Ittefaq’ is important for Sidharth Malhotra and Sonakshi Sinha?